THE Edge Media Group’s recently launched all-new theedgeproperty.com, a one-stop free property portal with exclusive news, listings, new launches, data and analytics, created a buzz in the Klang Valley last weekend. 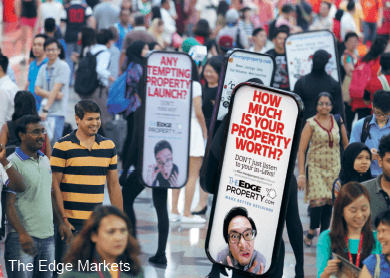 Over three days from May 8, cruisers — four human billboards dressed in black skinsuits and six brand ambassadors donning cute 3D model house headgears — swept through high-traffic streets, busy food and beverage outlets and shopping malls to promote theedgeproperty.com. Besides making heads turn, the human billboards and brand ambassadors handed out balloons and booklets outlining the website’s unique features — The Edge Fair Value, an algorithm-generated indicative value based on the most recent real transacted prices; advance analytics by area and property type on price per square foot, absolute price, historical price and transaction volume; advance analytics based on projects (transactions, asking rents, surrounding amenities and comparisons with nearby projects); hot-spot tracker that tell you what is trending; proprietary news, research and feng shui consultation; and free property listings. Also distributed were copies of the inaugural issue of The Edge Property — a property pullout published together with The Edge Financial Daily every Friday. In the three days of the ground activation campaign, 10,000 copies of the pullout were given out to a receptive crowd. In total, 200,000 copies were distributed in the Klang Valley, Penang and Johor Baru. “The objective of the campaign is multi-pronged. First, we wish to spread the word about the launch of theedgeproperty.com, a free portal that is unique and certainly the first of its kind in Malaysia,” says The Edge Communications Sdn Bhd managing director Au Foong Yee. “We seek to empower users of the theedgeproperty.com to make better decisions by providing them with breaking news, property-related information such as new launches, transaction data and analyses. The immediate feedback on theedgeproperty.com was positive, with users affirming that before making decisions on investments, they often go online for more information. “I believe the new portal and pullout will create more transparency in the local property market, especially with the help of accurate transacted data and research analyses,” says 32-year-old IT consultant Edison Liong Chan Yong. Another reader, Chandler Kwek, 30, says it is good that The Edge Media Group is expanding its coverage across different platforms. “The good thing about theedgeproperty.com is that it enlightens users about the latest rental rates, average transacted prices and so on for free. As an investor, this kind of data is most valuable,” says Kwek, who is project director of web company Sweetmag Solutions. Ho Kay Tat, publisher and group CEO of The Edge Media Group, says an additional 40,000 copies of The Edge Property will be printed on top of those distributed with the Friday edition of The Edge Financial Daily. theedgeproperty.com was officially launched on May 7 at a hotel in Kuala Lumpur. About 250 people attended the event, including theedgeproperty.com’s launch partners and Malaysia’s top property developers — Gamuda Land Sdn Bhd, IJM Land Bhd, IOI Properties Group Bhd, Mah Sing Group Bhd, MKH Bhd, Sime Darby Property Bhd, S P Setia Bhd, Sunway Bhd, Tropicana Corp Bhd and UEM Sunrise Bhd. The Edge Media Group executive chairman Datuk Tong Kooi Ong said during his presentation at the launch that the portal is a comprehensive, agnostic and inclusive free platform that aims to help investors in Malaysia, Singapore and the region to be better informed and to make better decisions. “You will find the portal comprehensive and free to use anywhere. It includes listing information, tools, news and research reports. It is agnostic as it is a channel platform that is open to all in the industry, such as real estate agents, developers and banks. We are inclusive because we serve all stakeholders in the industry without replacing anyone, but instead, we aim to add value to all the industry players. Three major roadshows and carnivals to promote theedgeproperty.com will be held in the second half of the year in Petaling Jaya, Penang and Johor.